It’s always a special time, one among many, offered through Respite’s site-based GAP program for a group of people who gather each day from different programs, schools or their home to enjoy a few hours together sharing stories, playing games, socializing and even line dancing. The GAP program is offered from 2:30 – 5:30 p.m. Monday through Friday in the Allegany Day Hab room until it’s time to go home. It is similar to an after-school program, except the friends are often adults, some with developmental disabilities, who value the Respite staff and their long-time friendships. “They go outside sometimes, play games, watch movies, bake, cook, make pizza, do art projects. You name it,” Mary Ellen Gangemi, Respite manager, said. Shannon Magnetti is the coordinator of the program whose responsibilities include setting up the monthly activities calendar, schedule of those who attend, and staff who work each day. “GAP is a place where they feel safe, where they can vocalize their thoughts and feelings,” Angela Cousins, said, greeting Justin. 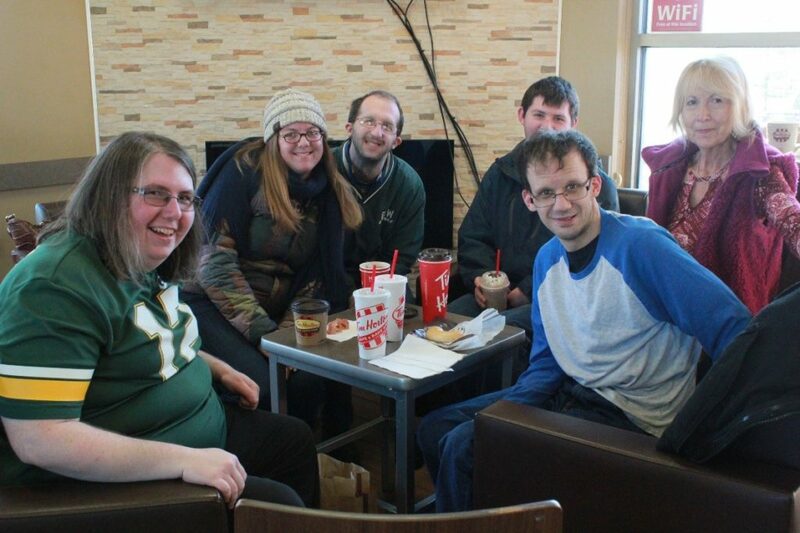 The group is designed for fun, recreation, socialization and includes short trips into the community which typically includes a standing date at Tim Horton’s. “I love getting Chamomile tea there. I want to be healthier and Elizabeth always helps me make a healthy decision,” Justin said. “Later, when we get back from Tim Horton’s on Thursdays we play games,” Patti Putt said. “I love GAP. 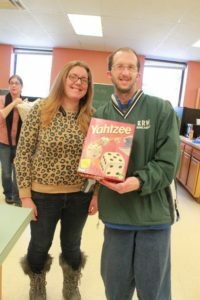 Sometimes we play games,” Justin added, smiling brightly as he held up a game of Yahtzee. The group follows a general guideline of monthly activities that often include line dancing with Patti. “Each day there’s a different group here,” Elizabeth Binder, said, adding that each group has its own unique bonds of friendship. The staff includes Angela, Elizabeth, and Patti. Angela has been in GAP only a few months but has provided respite for the Family Care Program for several years. Elizabeth has been with the GAP program for five years and has worked with individuals one-on-one for Community Hab. She also provides support for the Saturday recreation respite program and works in the Youth Residence. Patti, who also teaches line dancing for BOCES and the Allegany Legion, began working with the Agency in the Children’s Learning Center in the late 1980s and also works with two individuals through the Community Hab program. She began teaching line dancing only a few years ago and is often called to teach it throughout the community.